Dairy shed feeding systems are designed to deliver concentrated feed during milking to supplement cows’ pasture based diet. These systems have a low labour requirement and provide a lot of flexibility in the type, quantity, and timing of feed that can be included in a farm system. They can also be designed to provide different feed allocations to individual cows. Defining the feeding management needs of the farm is the first step in designing a suitable feeding system. 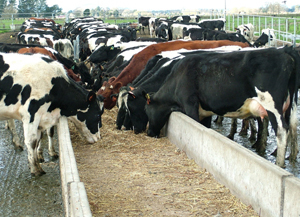 Consideration should be given to cows’ potential eating rates of the selected feed and the quantity required. 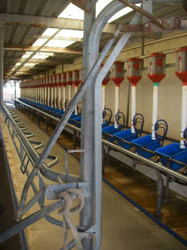 Herringbone dairies require the feed to be delivered to each bail position. This increases the complexity and cost of the equipment required. NOTE: It is not advisable to implement a dairy feeding system for the primary purpose of improving cow flow. It is preferable to use good husbandry and dairy design to maximise cow flow rates at milking time. Although in dairy feeding can encourage cows into the dairy, it will always provide cows with a reason to delay their progress out of the dairy. Deciding whether the installation of a feeding system is the right solution for the farm and whether there are the resources to run and maintain it is imperative before an investment is made. Choosing the correct system. There are many different types of feeding systems. Knowing how to choose the correct one will maximise the returns from investment. Calving pattern – seasonal or split calving? What type of feeds will be fed through the system? e.g. Palm kernel expeller. What form will the feed be in - pellets or meal? How often will the feed type be changed? How much time will cows have to consume the feed? How will the feeding effect the entry and exit of each group of cows? Variations in individual cow milk production. Desire to maximise yield per hectare or per cow. Labour to operate the system at milking time. Labour and skill required to manage the system. Backup systems needed to cover down times and during electricity failures. Cost of the technology compared with the estimated financial return. Impact of feeding on cow health. Future goals of the farm and available budget.